« I’m a Member of the Growing Tree Toys Blog Network! Ever since Riley became old enough to use a sippy cup, we have had problems in one way or another. First, we started with the cheap sippys from Wal-mart and they were horrible. The lid was ridiculously tough to get off and on and the valve would come out any time the cup was bounced or dropped. 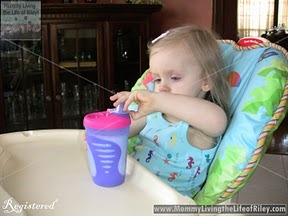 Next, we tried using the Avent sippy cup inserts for our bottles. Riley used Avent bottles the entire time I breastfed her and so we thought that maybe the sippy insert in the top of her bottle would work well, since these were her favorite bottles. The result? I've never seen anything leak or crack so badly. Unfortunately, Riley has a habit of throwing her sippy cup on the floor when she doesn't want to eat any longer and I'm pretty sure all of our bottles are cracked or broken in one way or another. Then, I was contacted by Tommee Tippee to review their new explora truly spill proof sippy cup and I thought, "A sippy cup that can stand up to all of the abuse that Riley dishes out?" I've gotta see this. 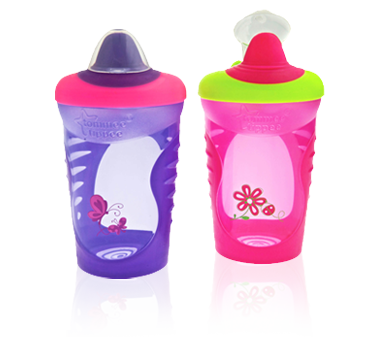 The explora truly spill proof sippy cups are sold in packs of 2 for $7.99. They come in either purple and pink or blue and green. Unlike other valve systems our active sensor valve is designed by a physicist to be both so sensitive that liquid flows on demand, yet truly spill and leak proof. I was sent a 2-pack of explora truly spill proof sippy cups in purple and pink from Tommee Tippee in order to facilitate my review. The first thing I noticed was how brightly colored and cheery they were. They also were lined up and down with plenty of rubber grip patterns on the sides of the cups. Riley usually had trouble with her Avent bottles sliding out of her hands, especially if there was a little condensation or other moisture on the outside. After using the explora sippy cups for over a week, I can say that the cup has never slipped out of Riley's hands yet. The feature that really wowed me though, was the hygienic cap that covered the drinking spout. It was permanently attached to the cup itself, so as not to be lost or thrown on the floor, and it was very easy to snap on and off of the spout. There is even a depression in the top of the lid for the cap to fold neatly into when not being used. This way, the cap will not interfere with the child's drinking from the cup. Riley feels like such a big girl when she takes the cap off to begin drinking and puts the cap back on when she's finished. I was also pleasantly surprised that the spout itself was soft and pliable. 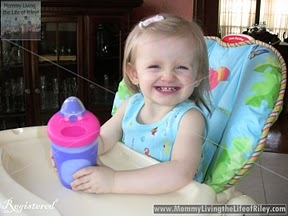 I imagine that this spout felt good on Riley's tender gums and she always seemed to get liquid out of the cup easily. Some sippy cups we've used in the past were way too hard to drink from and so Riley gave up without having drank much. The spout did not leak at all and the valve did not come out of the cup...definitely a plus! Finally, I was skeptical at how well the valve would actually stay in the cup and how well it would clean up. I have used sippy cups before where it was virtually impossible to get the cup's lid truly clean. Milk always seemed to lodge itself in some hard-to-reach crevice and cleaning was always a hassle. I put both of these lids in our dishwasher and then carefully inspected each one to see where the milk would be left behind, but I was surprised to find that there wasn't any! The sippy cup was completely cleaned in the dishwasher! YAY! This is a very well-made and well-designed sippy cup! I honestly couldn't find any weaknesses with the explora line of sippy cups. If you have a toddler that needs a cool, durable and sanitary sippy cup, then look no further than Tommee Tippee! The colors are bright and inviting and they will keep your child's interest. The rubber grips will ensure that your child won't lose his/her grasp on the cup and the plastic spout cover is the most hygienic, ingenious thing I've seen on a child's product in a long time. These wash well in the dishwasher and are the best sippy cups around in my opinion. Disclosure: I received the explora truly spill proof sippy cups in purple and pink from Tommee Tippee in order to facilitate my review. No other compensation was received. This product review is based on my own personal experiences with this item and is completely honest and objective.